The workshop will include discussions on the societal myths that surround tools and building that often keep women from comfortably participating. All of the facilitators are female, work/live in the East Bay, and are volunteering their time. Donations accepted and very appreciated. Registration opens August 31st 2016. Sign up now! 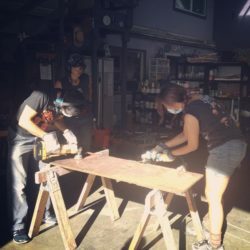 This entry was posted in Gender, Myths, Uncategorized and tagged frailty myths, gender, gener equality, oakland, safe space, social construction, tools, women only, woodworking, workshop. Bookmark the permalink.